Of above statements, two are right and one is wrong. 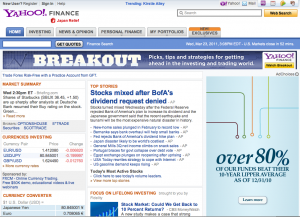 There is a button, (barely) visible in the upper right-hand corner of (some) ads. 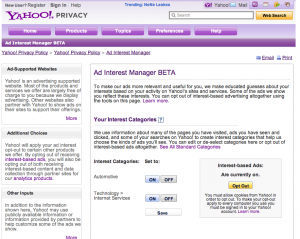 It does provide users with information about Yahoo’s advertising business. But it does not provide a chance to opt out of cookies. And thus, it is certainly not ahead on the New EU law. The new EU law that the headline is referring to, is the e-Privacy Directive 2002/58/EC as amended by Directive 2009/136/EC, that has to be implemented by member states by May 25, 2011. It is not clear whether this informed consent means “express” consent, but what is 100% clear is that the user has to somehow give his/her consent, which implies at a minimum a choice to opt-out of having cookies placed on his/her device. A website that informs its users of its processing practices , or more specifically, of its tracking practices via the placement of cookies on the user’s device, but does not give the user the choice to refuse those cookies, does not abide by the requirement of consent. How can the user consent to the placement of cookies, when he/she doesn’t have a choice whether to agree or not with that practice? It’s like feeding a real “cookie” intravenously to a child without asking it permission, explaining to the child what the ingredients of the intravenous cookie is and the mechanism of intravenous feeding, but not giving the child the option to disconnect the feeding tube. Did the child consent? No, because being forced is not the same as consenting. 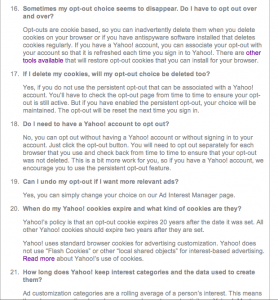 It’s exactly the same with Yahoo’s AdChoice Button, which is NOT a cookie opt-out button. All it is, is an opt-out button for receiving targeted ads. If one opts out through the AdChoice opt-out button, one will not see “creepy” ads personally targeted to the user’s profile. That’s all. 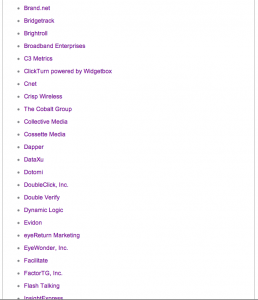 The user who opts out, will still have cookies placed on his/her computer, will still be tracked by third parties advertisers and will still end up in lists and profiles, to be sold to the highest bidder, and will still risk being dicriminated by employers, insurers, bankers etc…because of information found on these databases. 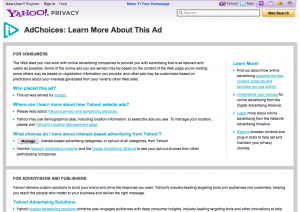 I first had to click on a few Yahoo pages until I found an ad with the AdChoice button. It is obviously not a widely accepted practice yet. 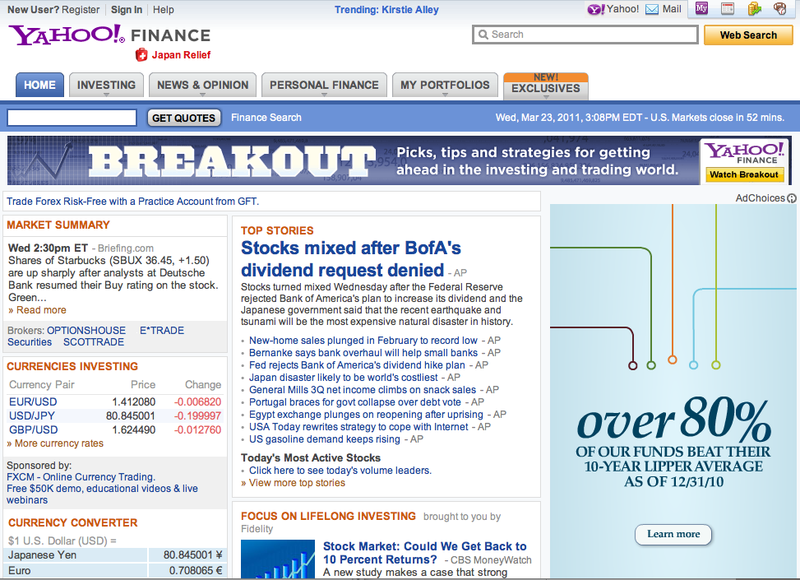 Finally I found one: It is the little grey icon above the “over 80%” ad: do you see it? After I clicked on the AdChoice Button, I got the page below, offering me a slew of links to “learn more about this ad”. On the page that appeared next, I finally saw an icon for opting-out of Interest-based ads. I clicked. That was CLICK NUMBER THREE. Oh, but what did I see in tiny letters below the opt-out icon? Aha, another click, if I want this to work from my laptop or my smartphone, or from the computer at work. I clicked. That was CLICK NUMBER FOUR. 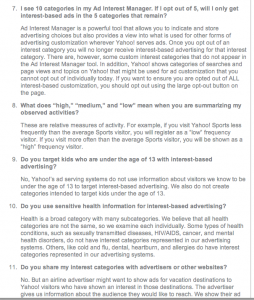 This is the page that appeared next: Yahoo Ad Interest Manager FAQ. There were 21 FAQs. I started reading. 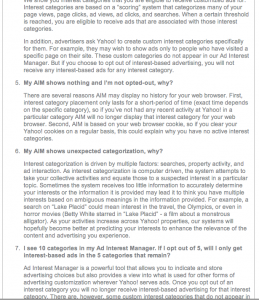 The FAQs explained the different aspects of targeted advertising. OK, a nice long read, but what was I looking for again? I forgot. Great! Additional choices. I like that. I clicked on “analytics products”. “Yahoo! Web Analytics is a browser-based system used to collect information about visitors to our customers’ websites. Yahoo! Web Analytics uses web beacons and cookies to collect data about visitors to our customer’s websites. This data is sent to Yahoo! by your web browser as part of your interaction with a customer’s website. 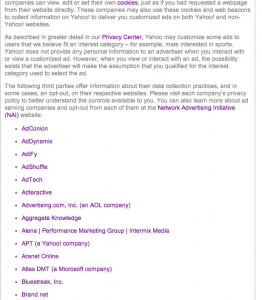 The data collected commonly includes IP address, time spent on webpages, links clicked, or advertisements viewed on those pages etc…etc.. Most browsers are initially set up to accept cookies. If you would prefer, you can set your browser to reject cookies, or to reject third party cookies only. If you reject cookies, you may not be able to sign in or use other features of websites that rely on cookies to enable the user experience. 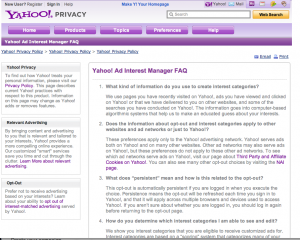 If you do not wish to have information about your activities on our customer’s websites used by Yahoo! as stated above, you can opt-out here. 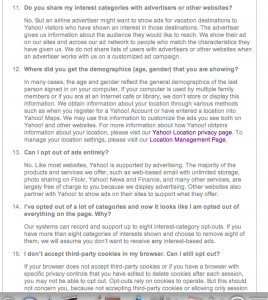 This opt-out applies both to use of the information on behalf of our customers and by Yahoo! for its own purposes as described above. I FINALLY FOUND THE OPT-OUT ICON FOR OPTING OUT OF COOKIES! YAHOO! And what does appear after my triumphant click? If this page looks familiar, that is because it is the same page I got after CLICK NUMBER THREE, allowing me to opt out of the creepy targeted ads, but not out of any cookie placement and/or tracking. 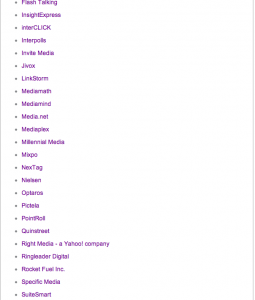 You see, at Yahoo, there is no escaping the evil tracking cookies by clicking on some magic AdChoice button. 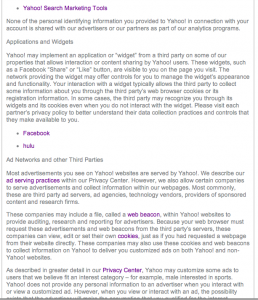 They do mention on the previous page that one can set the browser to reject third party cookies, but you don’t need an ADChoice button to do that. Many people still don’t know about this option, and those people will certainly not learn about this option through reading a text, buried somewhere after the FIFTH CLICK. 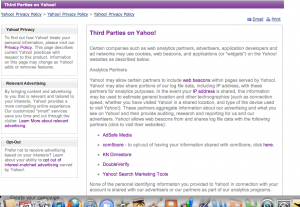 I looked around a bit more and found a link to third parties that have cookies on Yahoo. The list is quite long. I hope I have suffiently demonstrated why the AdChoice button will not, by any standards, satisfy the new e-privacy laws in the EU. I believe it is also clear that the AdChoice button, by requiring so many clicks to get to an actual choice button, and by requiring a user to spend a few hours on the site to actually understand what the AdChoice button is all about, falls short of satisfying all current thinking on privacy principles, whether one calls it FIPPs (Fair Information Privacy Practices), Privacy by Design or Privacy by Default. In other words, when you explain to the child what cookie you put into the feeding tube, do it in plain English, not in Chinese. At least the child will understand that it is being forcefed a cookie. 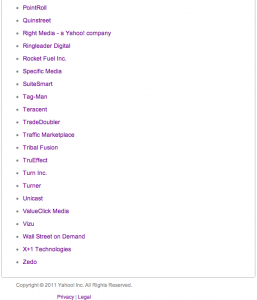 On which page of Yahoo’s “novel” was that to be found again?